Yes. The transaction fee is $450 on each sale. It is capped at 12 sales and then $99 thereafter. Team caps are adjusted up by 2 sales for each team member on the team. Yes. Unlike some brokers who are off site and out of mind, our broker is local, active and willing to encourage our agents and available to answer questions, big or small. Yes. We offer over 450 on demand 24/7 online real estate training videos for new and experienced agents from Real Estate Expert David Knox. Our broker is a Buffini Certified Mentor, as well as a Tom Ferry Certified Trainer. We offer local training of Buffini & Co. as well as Ferry programs,multiple times each year. For agents looking for more personalized training, we offer one-on-one coaching and mentorship programs. May I negotiate my commission rate? Yes. Commission rates are always negotiable and you are allowed to charge what fits your business model. The real estate environment is very competitive, we believe you need the ability to be flexible. May I set up a team? Yes. Remember, we are SIMPLE - Team members enjoy the same flexibility our brokerage offers Team Leaders and only adds 2 sales to the Team cap. Where do I get signage? We have ready made templates for you to download to provide to any sign company of your choice. You also have the choice to make a unique sign that reflects your personal choices - as with all advertising, it must comply with TREC rules. May I create my own sign design? Yes. There are some TREC requirements we must address, but we have thought how to make that Simple too. Branding yourself is important, we can help keep that simple. On a Sale - A commission distribution authorization (CDA) form will be sent to the title company with disbursement instructions. When the Title Co. does not receive the CDA in time or a mistake is made, the check is cut by the brokerage. 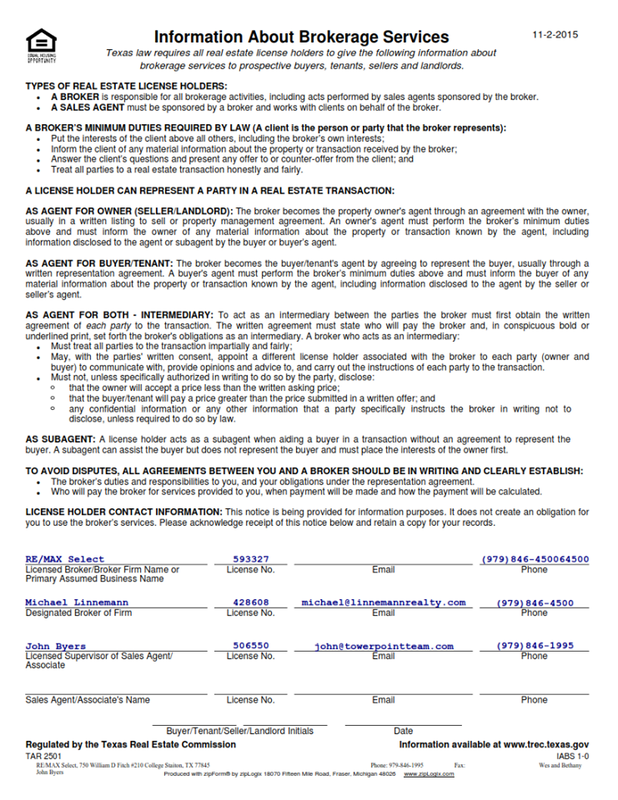 Lease- Due to the nature of leases, the full lease commission will be paid to TowerPoint Realty after which your commission check will be cut to you. No. We do host several events to build community. If there is information that needs to be shared with you, we will utilize email, our Intranet page, and even hold an online video call if needed. One of our 'a la carte' services is to help you create any kind of marketing material you choose. Yes. Stop by anytime. We are located at 1700 George Bush Dr E. Suite 250 in College Station and someone is usually there 9:30 to 3:00 M-F. We have a small conference area in our lobby and a small office space for agents to drop in, plug in, log in, and get some work done. NONE of the space is leasable or for long term use. We believe, based on past experience that most space is wasted. That is why we choose to lease very little. We recommend to our agents that they should work from home. The office is small, where do I meet my clients? The real estate market is shifting quickly, ask yourself, how many clients actually want to drive out to a real estate office to meet? Most agents find that it’s nice to be able to meet near to where they are seeing homes with clients. Many of our agents meet their clients at a Starbucks or similar location with free WIFI Internet access. If a quiet, professional office is needed, a couple of the local title companies and mortgage companies will let you use a spare office or conference room (if available) to meet your client. Do you allow Part Time agents? Simple - Yes. You can work full time or part time. At TowerPoint Realty there are no sales quotas outside the need to close 1 transaction per year to remain with us. What's the catch - where are the extra fees? No Catch : our fees are Simple: an annual fee of $500 due on the first transaction after your anniversary of each year. $450 Transaction Fee - capped at 12 Sales (unless a team) and $99 thereafter. There is a one-time activation fee of $99 when you first join. No Hidden or Franchise Fees. Just contact us and we will walk you through the paperwork you will need to get started - Simple.